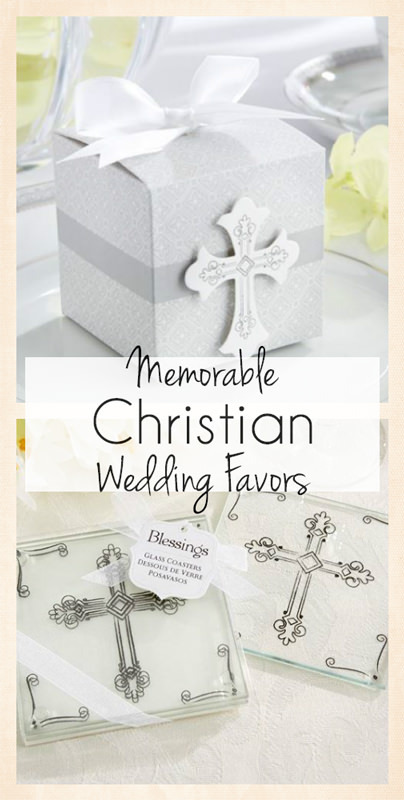 Memorable Christian theme favors for your wedding can be hard to find, but we found some that will make the day even more special. You will stand before God and all of your loved ones to dedicate your heart and soul to one person who will love you till death does you part. There is nothing more amazing than joining together in the house of the Lord and testifying your undying love for someone who has touched your life in an amazing way. The only thing you need to make the event memorable is the right collection of Christian-themed wedding favors. Start by drawing inspiration from your favorite Bible verses. You can make a variety of DIY wedding decorations by creating posters, scrolls and other items that features verses you feel represent the love you share with your future spouse and the importance of love, romance and commitment in your life. You can also make use of a variety of pre-made wedding favors that fit the Christian theme perfectly. Here are some of the best options selling online right now. 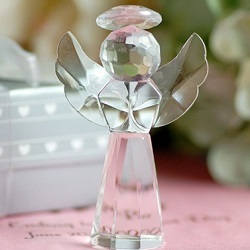 Crystal Angel Keepsakes - Beautiful crystal angels will watch over your guests from mantels, shelves and dressers for years to come after your wedding day. 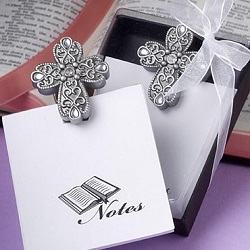 This is one of the best Christian wedding favors on the market today because it is affordable as well as adorable. 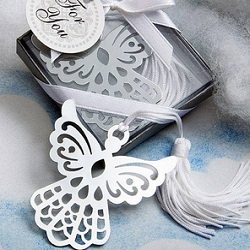 Angel Bookmark Favors - These silver bookmarks feature fun tassels that will hold the place in many books over the coming years. Such a simple, elegant gift idea, but it is one of the most popular wedding favor options. Cross Memo Pads - Your guests can tuck these pads into their Bibles to make notes of memorable passages come Sunday morning service. Your guests may also find them useful at home or in the office where they will bless everyone who finds a message scribbled below the cross. 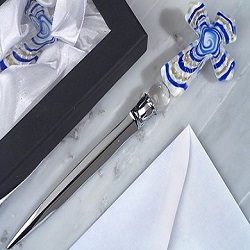 Glass Cross Letter Opener - These beautiful deco art letter openers will bring back memories of stained glass windows and church chimes. They are also functional items that your guests will feel blessed to own on a daily basis. 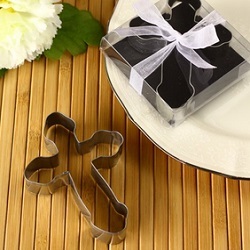 Cross Cookie Cutters - These adorable cookie cutters are affordable Christian theme favors that you can hand out to guests of all ages. Send them off to make sweet memories with their loved ones. There is nothing more precious than family. Decorative Cross Glass Coasters - These glass coasters add a decorative element to the tables in your reception hall, but they are also functional gifts that your guests will enjoy taking home. You may even want to leave a few in the church for social functions. 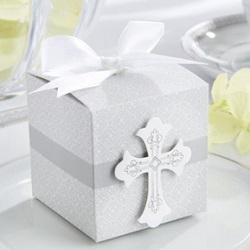 Cross Favor Boxes - If you don’t have a large budget for your Christian theme favors, these boxes allow you to quickly throw together meaningful and affordable favors. Add mints or other candies, or insert unlit tea light candles. Still looking for more Christian-themed wedding favor ideas? Here are a few more to bless your heart and soul. 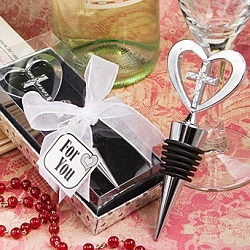 Heart and Cross Wine Bottle Stoppers: These are the perfect gifts of gratitude for select guests who made planning your wedding easier. Hand them out with love. Glass Photo Coasters: These coasters aren’t specifically Christian-themed, but they do represent some of the most important Christian values. Glitter Cross Votive Candles: Use these as decorative elements, and then send them home with your guests. Mini Cross Charms: Hand these out to all God’s children, and use them as decorative elements as well. Cross Place Card Holders: Show your guests to their seats with these beautiful cross holders.